For those who have followed my medical issues this year, I want to thank you for all your support and health suggestions, as well as give you a quick update. I just had the first follow-up surgery after my emergency surgery back in July, so prayers, good thoughts, and crossed fingers are all appreciated! There’s currently no sign of the infection. It’s hidden out for years before, but hopefully, all the techniques I’ve been trying from your suggestions to beat this antibiotic-resistant, bone-disintegrating infection mean it won’t come back this time. There’s not an easy answer to that question, as everyone has their own definition. Voice is personal—not just for writers, but also for readers. There’s a reason why we love some authors’ voices and dislike others…and why those judgments aren’t universal. What one reader can love, another reader can hate, etc. We’ll talk about the elements that create our voice in just a minute, but first, I want to start with what I think is the essence of voice. There’s a person behind the words. Voice is intimacy. Voice is what invites readers to join the characters in their journey. How do we invite readers to come closer? Many people have tried to identify what goes into creating our voice, but it’s a hard thing to define. We often just know it when we see it. How many senses do we evoke? What tone do we take when we write? How much do we show vs. tell? We’ve talked before about how we need to find the “right” balance for our descriptions. The “right” amount will be different for every writer because how we use description comes down to the types of stories we innately want to tell. Some want to write stories with lush descriptions that give a strong sense of time and place. Others sketch out enough of the basics to anchor readers but prefer to keep the story moving. There’s no right or wrong answer, but understanding our preferences helps us know what our voice is. make a reader feel connected to the character (deep point of view, etc.). Either way, embracing our choice will help readers feel invited on a journey. What types of characters do we gravitate toward while we’re writing? Some of us write stronger alpha males than others, some write snarkier women. The common threads between our characters—from one heroine to another or one hero to another—give insight into our voice. This doesn’t mean we can’t create characters who aren’t a good match for our voice, but they might be harder to write. This also doesn’t mean that our main characters from one book to another are interchangeable. Strengthening Tip: If we know what kind of characters we gravitate toward, we might be able to develop them faster during drafting, or we might have a better handle on how to strengthen their personalities during editing. We also might have a better sense of what’s causing issues when something feels off with them. For example, if a character doesn’t feel right, maybe we can see if they’re going against our voice in any way. Are they too passive in some lines or scenes? Too aggressive? The more we know our voice, the more we can protect it. And the stronger we’re connected to our characters as authors, the better the chance that readers will feel connected to them as well. Do we write beat-driven plots where readers sense when big events occur, or do we write plots where one event blends into the next? Do we use lots of twists or fake-outs? Do we include lots of subplots, or do we stick to one main external plot and use internal character arcs to flesh out the story? What kind of villains or secondary characters do we write, and what kind of conflict do they create? Some authors tend toward bigger external plots with villains involved at each step. Others tend toward bigger internal character arcs, where the external antagonist or villain comes out of the shadows only for the final act. 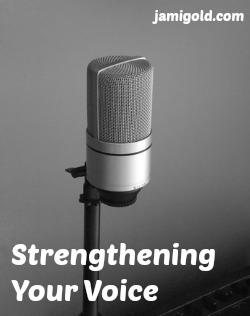 Strengthening Tip: Knowing our tendencies helps us understand our voice. And like we mentioned above with characters, the better we know our voice, the more quickly we might understand the issue when something feels off. If a story feels too thin or too complicated, we can take a look at how the plot compares to our usual tendency. We can always push ourselves to try something different of course, but knowing our usual might help us fight off self-doubt when a story feels more difficult. It’s not us. It’s not the story. It’s just about growth and experimentation. Again, the more we understand our voice, the more we can protect it and make sure deviations are a conscious decision to try something different. Also, the more the plot flows and feels natural to us, the better the chance that readers will feel connected to the journey of the story as well. What’s the big picture and/or theme of our stories? Writers typically revisit similar themes over and over because on some level, all stories are explorations of our worldview. Of course our worldview influences our voice. Similarly, we might also write stories with similar premises. Heroines who discover how special they are. Heroes who must fight to get what they want. Those are the journeys we’re inviting readers to be a part of, so our premises are often the foundation of our voice. Strengthening Tip: As I mention in that post linked above, knowing our core beliefs can help protect us during revisions. We’ll recognize when an editing suggestion will help get our story closer to the one we want to tell or when it’s simply different from what we have and not necessarily better. Also, the closer a story connects to our beliefs and passions, the more likely that energy and drive will come out in our writing. Showing our worldview in our story creates a sense of intimacy for readers because we’re inviting them to learn about our innermost self. Do we end scenes or chapters on cliffhangers? Do we write with a lyrical quality or are our sentences more choppy? Do we use rhetorical devices and if so, which ones? Does our writing have rhythm? How much subtext do we include? The words we use and how we break up sentences, paragraphs, and chapters all act as one ingredient of our voice. Also, as Julie Glover mentions in her guest posts in that last bullet item, we need to have the basics of writing craft down before we can effectively “play” with our voice. Bad grammar because of lack of knowledge is different from bad grammar because of voice choices. Learn the basic craft to help ensure our voice is strong and confident. In addition, like the other elements, the better we know our tendencies, the more we can consciously emphasize the aspects we want. If we decide we like the humor, we can look for ways to add more, etc. Notice how all of those elements need us to become familiar with our voice a bit before we can strengthen what we already have? In other words, we have to practice writing a lot before we become good at recognizing what makes our writing ours alone and what makes our voice unique. Also, we can’t explore any of those elements with our voice until we have the craft down. If we’re still struggling with plot structure, our unique approach to plotting won’t be as clear. If we’re still head-hopping, the point-of-view of our characters won’t be deep enough to show who they really are. Same with the other elements. We’ve all heard how we should write multiple stories rather than editing the same one over and over. That advice isn’t just about making sure we’re moving forward. Writing new stories with new characters and new plots and new premises all works together to help us find the commonalities in our writing. Those commonalities inform our voice, the stories we like to write, and the stories that might be easier to write. And the more we know our voice, the more we’ll be able to resist misguided suggestions from others. Confidence in our voice strengthens our voice. How well do you know your voice? Can you describe it in regards to those five elements? What elements of your voice are strong and which ones are you still working on? What elements are your favorite to play with? If you’ve written multiple stories, how many did it take for you to have a clear idea of your voice? I tend to write lush and lyrical with a strong sense of place and sensory detail – though I’m trying to prune down my excess words, because I know I’m too long-winded. I have less of a handle on my big-picture voice, partly because I find the big-picture stuff like plot, character, and theme much more difficult than putting words together. But I know I gravitate toward certain types of characters – sympathetic antagonists, not-very-sympathetic antagonists motivated by egotism, self-doubting and depressed people, angry and often vengeful women, “adorkable” people, sensitive men. I also know there are certain thematic elements I love – people doing bad things for good reasons, complicated moral questions without easy answers, the value and necessity of ordinary people who aren’t considered “special” or “valuable.” I also know that my political, economic, and social views heavily inform what I write, though that’s probably true of many of us. I’ve definitely become a fan of authors because I’m a fan of their voices, and followed them places I might not otherwise have gone. Contemporary romance with a billionaire hero would normally be a “nope” for me, but I’m enough of a fan of Courtney Milan’s historical romances that I picked up her Trade Me and thoroughly loved it. I trusted her voice enough that I trusted her to do great things with material that usually wouldn’t interest me. Great post. Currently editing my NaNo and adding about 10K words. The strengthening tip “think out loud” I have heard from several professional writers other than yourself over the last couple of months. I am starting to do that now consistently and it is amazing how it gives insight into a paragraph or chapter or dialog. Oh I’ve never thought of voice in terms of the bigger picture (e.g. plot and characters) as well as in word choice, syntax too. I know for sure that I tend to write sweet, sensitive, and compassionate characters. It’s harder for me to write about ruthless, heartless people, unless they are villains, haha. For some reason, my boys tend to be more on the soft and sweet side, and my girls tend to be on the more masculine and strong side. Though most of my lesbians are REALLY feminine. I have only written four nonbinary characters so far, and there isn’t much of a pattern yet, except that I find them all really romantically attractive. XDD Oh gosh, I adore fellow nonbinary people! Hearing that your recovery is going well is like early Christmas. I’m so happy for you. You’ve been through enough. Here are my best wishes for a swift recovery and continued good health. I write in Deep 3rd and have written some short stories where I’ve nailed the voice, but it’s proving more elusive in my novels. I’m beginning to think I’m fighting my protagonist. She’s a quiet-spoken, but strong-willed. She’s also kindhearted, yet distrusting. For knowing all that, and much more, I’m coming to believe I’m trying to make her voice distinctive in all the wrong ways and smothering who she really is. So glad to hear you’ve beaten this infection!! Here’s to feeling better! Sorry to hear about all the health issue problems. Really hope it’ll be good for you from now on. 2016 has been a heck of a hard year. Hang in there! Rooting for ya!